Oak Barrels make the very best Vinegar. Fantastic for Whiskey and Great for Beer. for Kombucha and Ginger Beer Oak Barrels are incredible. Made from American White Oak. Why OAK? Nothing is better for fermenting and aging ferments than Oak. Oak adds a nutty, buttery flavor and additional tannins and nutrients to the ferment. Each year the beneficial probiotic bacteria and yeasts impregnate the wood, over time each cask develops a unique character of health and flavor. Oak breathes and allows in oxygen, which the yeast and bacteria utilize. Over the course of time barrel aging contributes substantially to the quality of the ferment. Used properly Oak will last more than a life time. In our own tests using Silver Needle White Tea our kombucha fermented in our oak cask produced a smoother deeper flavor - very fine. It did reduce the overall gluconic acid when compared to Silver Needle White tea fermented in a more traditional glass container. However it should be noted that overall Silver Needle White Tea fermented in a Oak Cask still produced far greater gluconic acid level than kombucha tea made with a black, green or combination of black and green tea fermented in glass. With our American White Oaks casks you can produce a fine ferment beverage rich in both taste and benefits. We give our barrels a medium toast. Lightly charring the inside of the wood. Charcoal is healthy both for the probiotics and ourselves. Charcoal removes a small amount of the "toxic" alcohol (methanol) and other impurities that occur naturally in ferments. Thereby your ferment is smoother and more mellow. A wine high in pectin may produce 2 or 3 mg/L of methanol. The Food and Drug Administration (FDA) advises that 0.1 percent of methanol by volume in wine was a safe level (10 mg/L). Charcoal will also absorb some acetic acid (vinegar) where you'll be able to more completely finish your ferment (less sugar) with less bite. 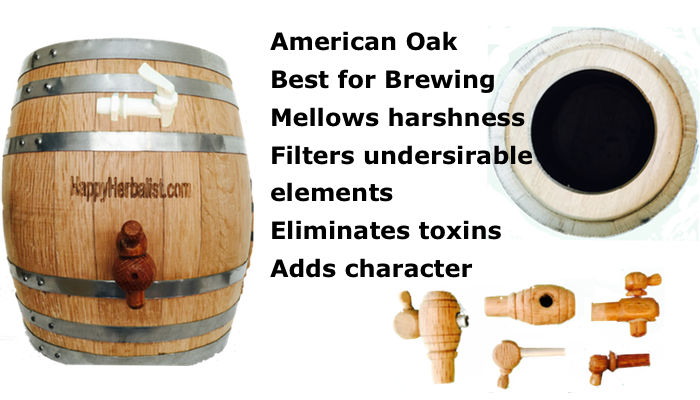 NOTE: We guarantee our barrels against initial leakage and damage. The barrel is expected to swell and not to leak upon following the directions above. The TOP, has been cut open. This does not affect the interiority of the barrel, but may cause wrapping and create an uneven surface. We do not guarantee against this type of wrapping. The pieces themselves may be removed. Such removal will not violate the interiority of the barrel. The barrels may discolor, become black on the outside. This is normal. A food-grade varnish may be used to prevent this. However we have found the majority of our clients prefer all natural and do not want any ingredients leaking into their brew. We do not varnish our barrels, oxygen does penetrate wood and aids the fermenting process. The barrel should be filled and maintained at 75-80% level. Campden tablets are commonly used to sterilize barrels when first using or to store the barrels when not in use.